Washington has been preparing for the inevitable “social explosions” by tripling Pentagon spending on special operations in Latin America. It’s easy to forget—especially in light of Washington’s support for what many are calling the “soft” coup in Brazil, which has led to the ouster of President Dilma Rousseff and the end of 13 years of Workers’ Party (PT) governance—that international financial institutions welcomed the PT’s rise to power in 2002. In the shadow of Asia’s 1997 financial crisis and Argentina’s 2001 economic meltdown, the managers of post–Cold War globalization were fearful of, as World Bank president James Wolfensohn put it, “social explosions.” In Venezuela, Hugo Chávez had begun his populist rattlings, while the rest of South America began to elect one leftist president after another. In Seattle, workers and environmentalists had recently teamed up to protest iniquitous trade treaties. Reform, neoliberals admitted, was necessary. In office for two terms, Lula largely delivered on his promise, threading the needle to significantly redistribute wealth while maintaining investment-friendly policies. At the same time, however, he also joined with Argentina and Venezuela to oppose much of Washington’s foreign-policy agenda, helping to derail the Free Trade Area of the Americas and refusing to participate in the United States’ “extraordinary rendition” program. Such independence irked the Bush administration, but Brazil under Lula proved Wolfensohn right. It was a stabilizing force in the region, preventing, in 2008, a war between Ecuador and Colombia and a coup in Bolivia. The Obama administration was less confrontational than its predecessor, but no less ideological in its preference for Latin America’s free-marketeers. Earlier this year, Obama praised Argentina’s new right-wing president, Mauricio Macri, calling him a “partner” who shares “universal values and interests.” He’s a “man in a hurry,” Obama said approvingly, as Macri moved rapidly to cut his country’s social-welfare budget. 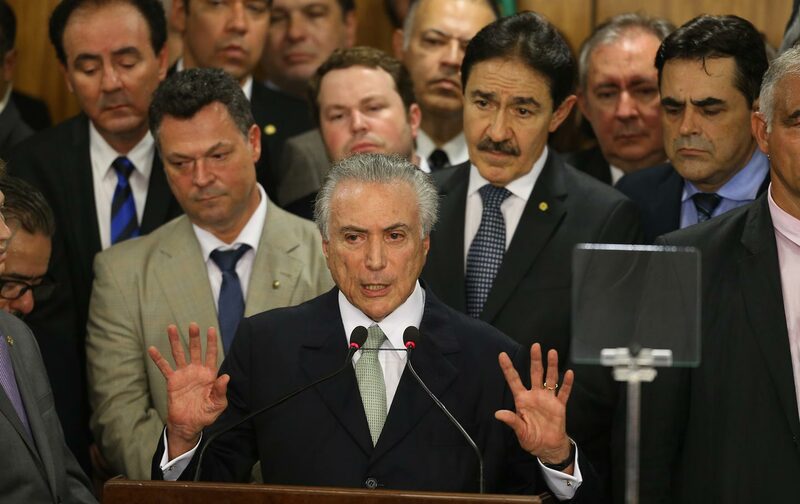 As for Brazil, Lula’s successor, Rousseff, not only continued to maintain a budget surplus in her first term but, faced with an economic downturn, put austerity measures in place. But even this wasn’t enough to appease her detractors. The White House sent clear signals that it viewed the blatant manipulations against Rousseff by her political opponents as legitimate, including by hosting a key architect of the coup in Washington and by sending Secretary of State John Kerry to Brazil to legitimize Rousseff’s tormentors. Today, much of Latin America is roiled by crisis—not just Brazil but Chile, Venezuela, and Argentina. So what is Washington’s plan? In past presidential successions, Beltway think tanks like the Brookings Institution, the Council on Foreign Relations, and the Inter-American Dialogue would produce lengthy policy papers, laying out recommendations for how the incoming administration should deal with Latin America. But today, with a new US president to be inaugurated in a few months, you will search the websites of those organizations in vain for a comprehensive blueprint to promote regional growth while lessening inequality, protecting the environment, and ensuring stability.